This is my neuro-typical son who happens to have the fashion sense of a five year old. Well, actually he was four last summer (2007) when the photo was taken. His style hasn't changed much since then. He still wears his beloved green rubber boots. Occasionally we check his style before he goes outside. To his dismay he's only allowed to wear those boots when its raining! Sometimes we have to remind him that one doesn't wear wool sweaters in the summer or shorts in the winter. I suppose there will be a time when this picture will have the potential to embarrass him when/if his parent(s) show it to peers or a significant other. 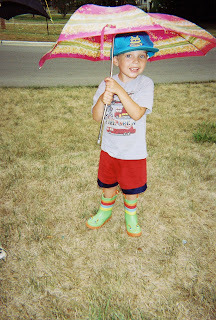 But, oh, to be five again when wearing green rubber boots and a blue hat while holding a pink umbrella is adorable. I'll just have to wait until I'm old enough to wear a red hat with a purple dress. Or maybe 'll pick my own quirky style. I'm thinking a yellow dress with multi-color polka dots, a turquoise hat, and purple shoes. What would you wear if you just didn't care? Oh, my. This sounds so much like M. Just the other day I had to hide all her warmer clothes because she was getting so furious and insisting the long sleeve shirts and sweaters would keep her cooler in the 100 degree heat. Argh! Throw a feathered boa in that mix, and you'll be stylin' sister! I just might do that!! Hmm... orange or fushia?